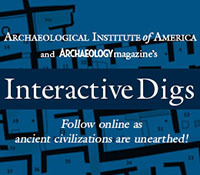 Our interactive dig’s first report from the field! Map shows Block 4, the area where we are working this year. The grade- and high- school students in our Experiential Learning Program use the letter designations on the two-meter units to keep track of the ones they are investigating. It’s the third year we’ve been excavating Block 4, and our interest is to explore the rear of the building and the area behind the block towards the rear walls and the “dead line” (where prisoners could be shot). We want to find out about the prisoners’ day-to-day activities and try to locate the back of the block. Click here for more on the questions guiding the current excavations. Although we have the site area covered, the amount of water that has been deposited on the island from spring snow and rain has resulted in ground water seeping into the excavation area. This has hampered our investigations, but luckily has yet to postpone them. We had three classes cancel due to the bad weather in late March, but so far fourteen classes have been able to participate. 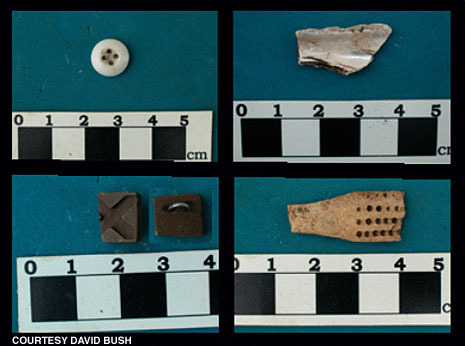 Some of the artifacts unearthed so far include a white porcelain button, a piece of shell cut by prisoners for their craft, a portion of a bone toothbrush, and a hard rubber carved "button" with a silver loop. Notice that the rubber carving is broken but had probably been prepared for a shell inlay. We have found hundreds of artifacts, as well as parts of the block itself. Most of the artifacts represent the activities of the prisoners, including craft and daily subsistence. We know from historical sources that the prisoners were making all types of chains, rings, trinkets, brooches, and other items that had inlays of shell, copper, silver, and gold, and we discover evidence for this almost every day–carved and cut shell, copper strips, and hard rubber waste products. We also find pieces of plates, bowls, crockery, and chamber pots, as well as glass containers which would have been used to store food or drink. Some of these items were issued by the Union to the prisoners, but many are items, such as the crystal glass we dig up almost every day, that they would have had purchased and shipped to them to maintain their Southern lifestyle. Our next report from the field will include an update of the prisoner research we have discovered during the past few weeks. We’ve also received more information about prisoners from their descendants and will include some of this in future field reports. Stay tuned! 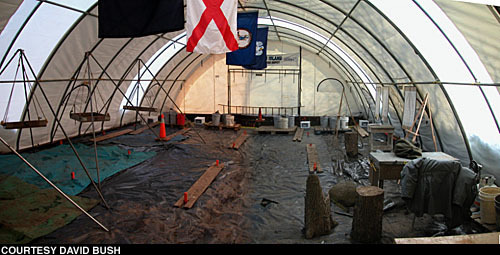 Students dig for evidence of prisoners' activities at Johnson's Island. This entry was posted on Sunday, April 21, 2002 at 1:07 pm	and is filed under Field Reports. You can follow any responses to this entry through the RSS 2.0 feed. Both comments and pings are currently closed.